Windows errors will always pop up over time. Whether it’s because our computers are getting old or because the software we’re using is badly coded, getting an error message is frustrating and can even prevent us from getting any work done. 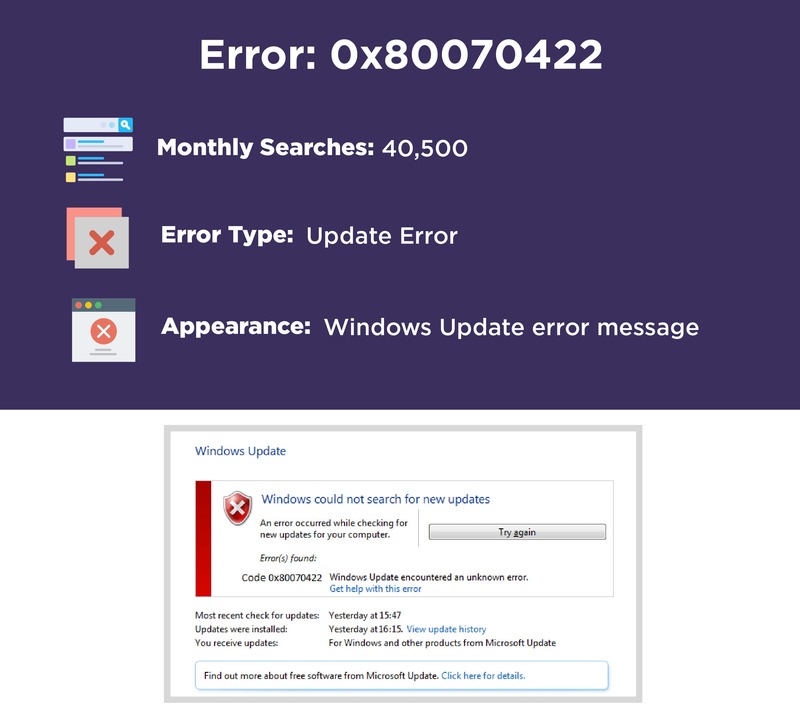 To help explain the most common ones, we’ve put together a list of the 10 most searched Windows errors of 2017 (according to Google Trends) and we’ll be going into more detail about them. This error is typically the result of Windows Update encountering a fault or an issue. 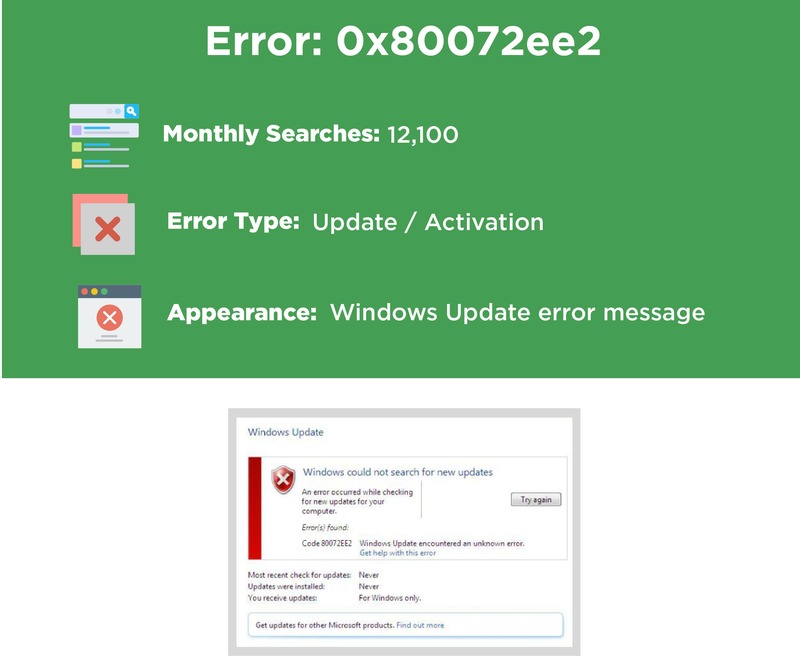 This can usually be fixed by navigating to your Windows services, setting Windows Update services to automatic and deleting the Windows Update download so that it resets your Windows Update files. This will refresh the Windows Update components and may fix the error. 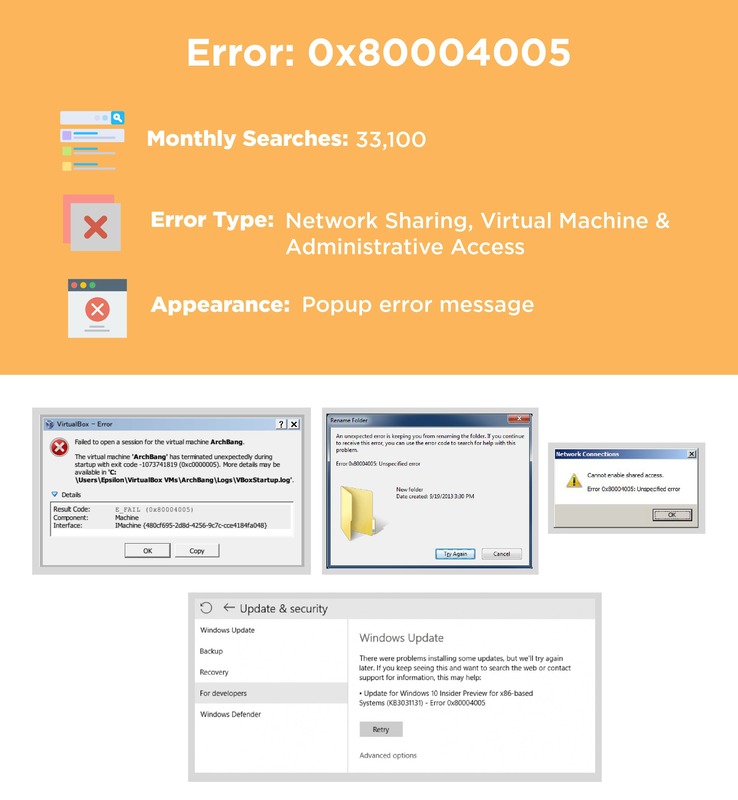 Error 0x80004005 often appears when Shared Folders, Drives or Virtual Machines cannot be accessed. It can also appear when a Windows Update fails to install itself due to the computer being shut down prematurely or during a power outage. This error typically appears when you don’t have Administrator access to your computer, such as being logged into a guest account or an account without Administrative powers. You may want to check your Network Sharing Settings to see if any changes have been made prior to receiving this error message. Some services or settings may be disabled, which could cause this error to show up repeatedly. If you make use of Virtual Machines, then this error code may also appear as a result of faulty Virtual Machine configurations in the BIOS. 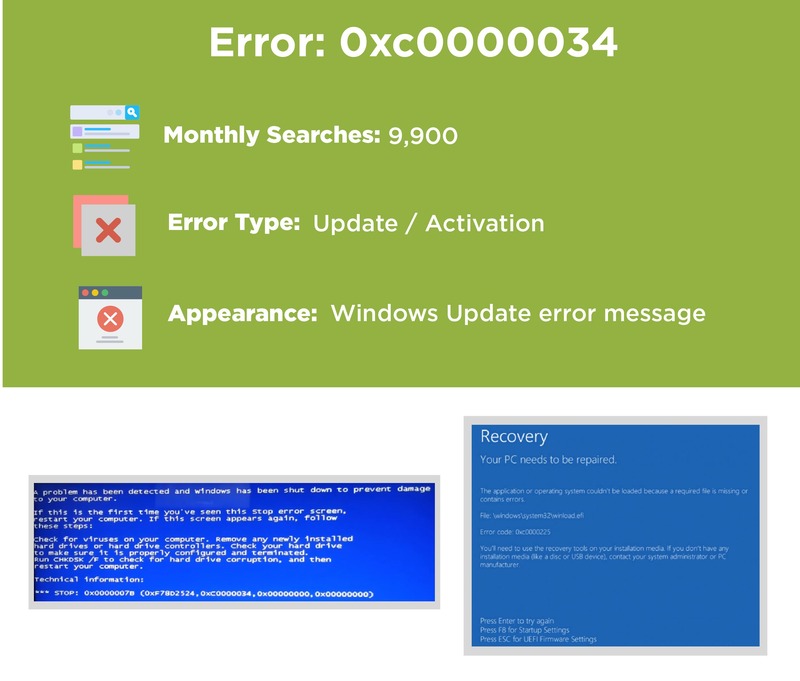 0xc00000e9 commonly appears as a result of a faulty Windows installation. For example, if you are using an old Windows installation disc that is starting to degrade, or if you’re installing from a USB drive that has damaged storage sectors or is corrupted. The solution here is to simply burn another CD or create a new Windows bootable USB flash drive. If it still occurs after a full reinstallation, then there’s a chance that the primary hard disk with the operating system is malfunctioning and the BIOS settings need to be reset. You may want to test your hard disk drive for errors, especially if it is fairly old. 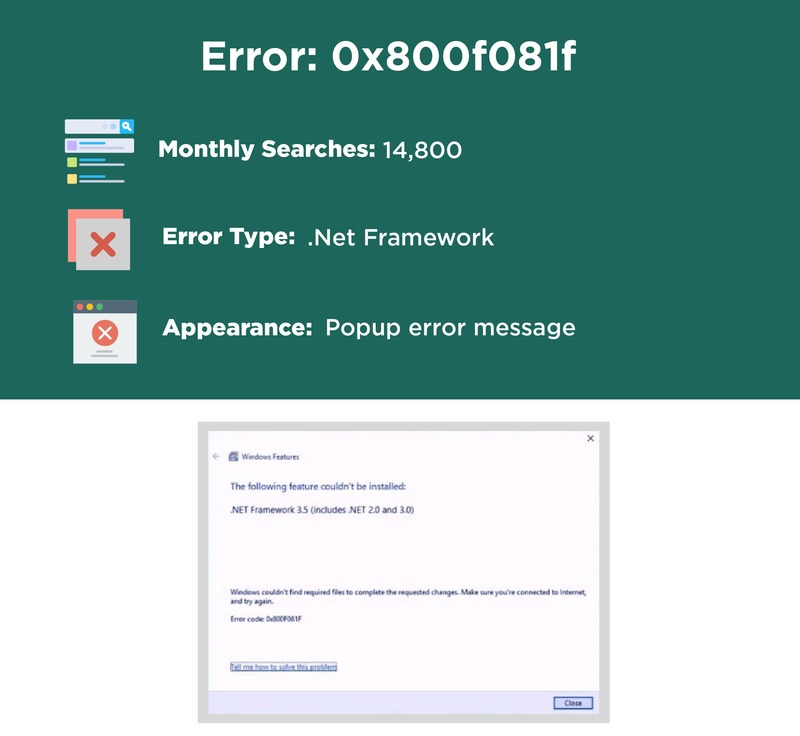 0x800f081f is related to .NET Framework 3.5 not being installed or detected and is often caused by a corrupted download or a failed installation. This is fixed by simply reinstalling .NET Framework 3.5 from Microsoft’s website. This error often occurs when the boot order in your BIOS settings is incorrect. It can also appear if your Windows boot file is missing or damaged as a result of a hardware failure. 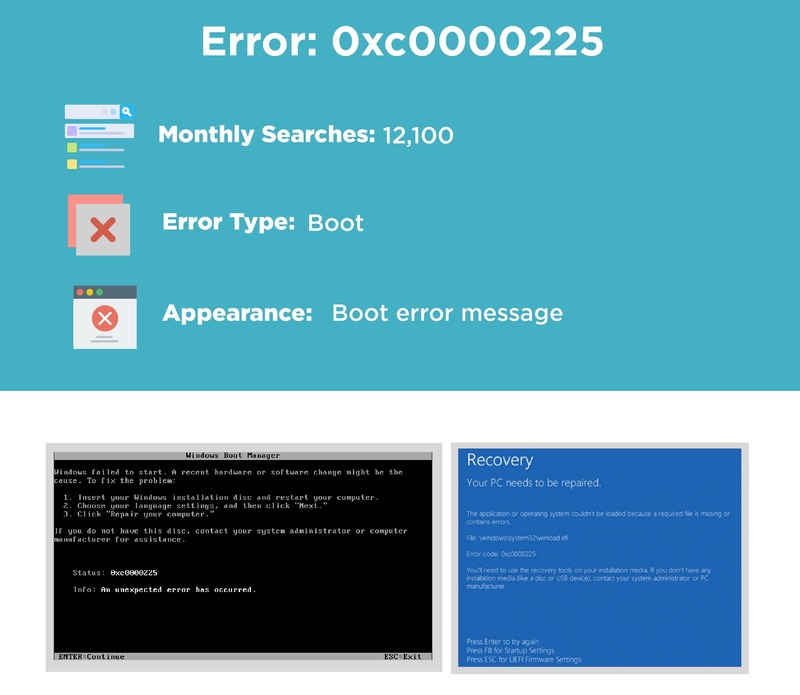 If your computer is unable to boot Windows, then it can easily be fixed by going into your BIOS settings and rearranging the boot order. Ensure that the drive with your operating system is first on the list. If this still doesn’t fix the issue, then opening your PC to ensure the SATA connection is the next best idea. There are also some cases where your SATA power cable is not providing sufficient power to the hard drive, so you may want to swap the cables, the SATA port used or potentially even try another power supply. 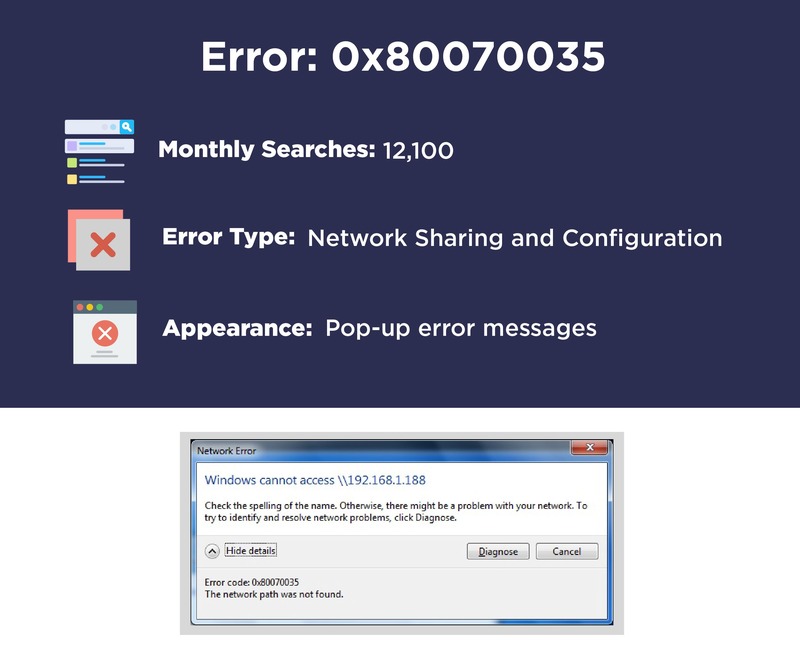 Error code 0x80070035 Windows 10 is a network error, which appears when you are accessing an incorrect network path, or the network path is not in the network. This may occur for instance when the PC you are trying to access is turned off or is not connected to the network. To fix this, double check that the network path if it is correct and that the PC you are trying to access is turned on and is connected to the network. The error could also appear when the computer in the network you are accessing has file sharing disabled. Enable file sharing so you could access it. 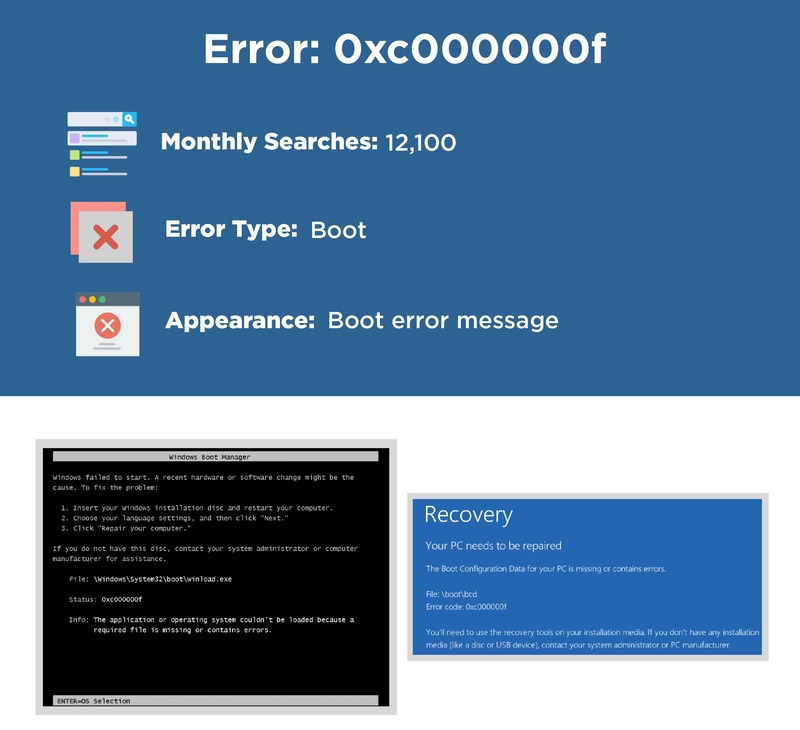 This error commonly appears during the boot process and is usually caused by a misconfigured BIOS setting. Make sure you check your BIOS settings to ensure that your primary hard disk (the one with the main operating system) is at the top of the priority so that it boots first. If this is already your primary drive, then you may want to repair your Windows boot files by using a repair disc or the startup repair tool. If the issue persists after these changes, then try to reconnect the primary hard disk by opening up your computer and clearing the connections of any dust that you find. As a last resort, try to reinstall Windows on your primary hard drive. If the install fails for some reason, then it’s an indication that your hard disk is failing or faulty and should be replaced. This Windows Update error typically appears when your connection to the Windows Update site itself is interrupted as result of a connection drop. It could also be due to a faulty internet connection, so make sure you run diagnostics to check that your connection is stable. Restarting your home router is one solution, but if you’re working in an office you will need to contact your IT administrator. 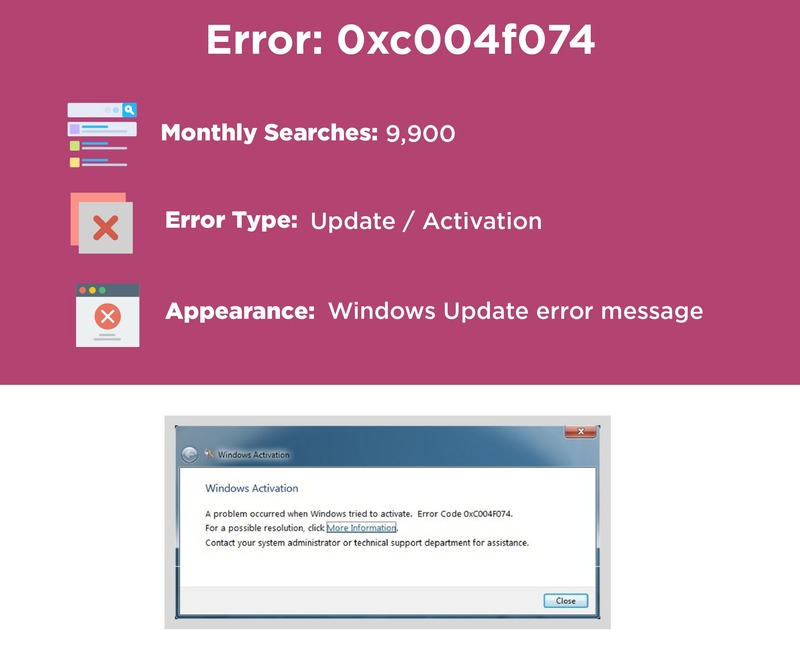 If you fail to activate your Windows license, then it’s common to see the 0xc004f074 error. If you’ve double-checked your license key and you’re still getting this error, then it’s possible that your computer time and date are incorrect and may have been reset due to your BIOS date being reset. This can be caused by a CMOS battery failure or another motherboard error. When validating a Windows License key through the Key Management Service (KMS) server, Windows needs to see that your Windows’ date and time aren’t too far off its own. If it is, then it will throw an error at you. This error typically appears when your computer is booting Windows. 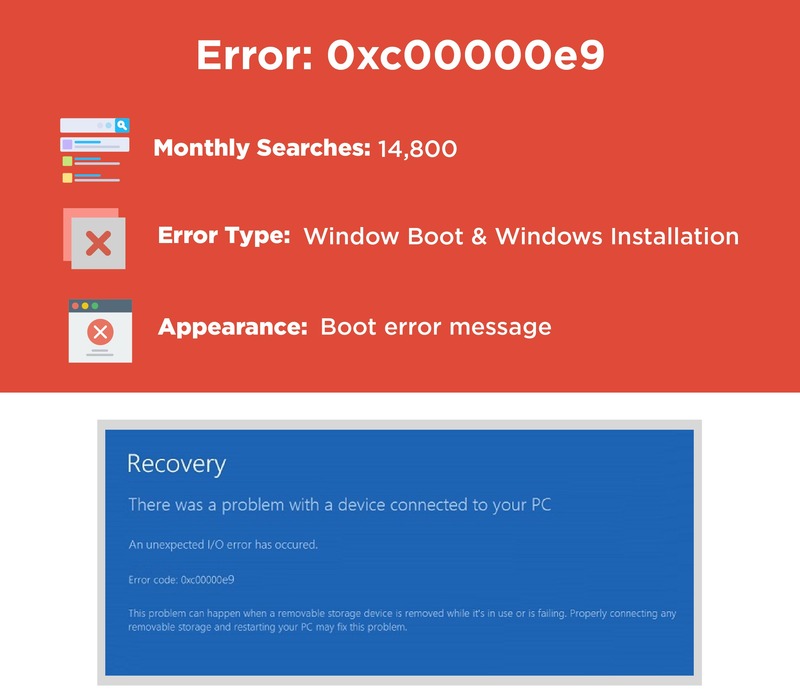 It can be caused by a faulty hard disk drive, incorrect BIOS settings, damaged, or even missing, Windows boot files. The first thing to check will be your BIOS settings. Make sure your primary hard disk drive is the boot drive where your Windows installation is located. If the problem continues, you can try to physically reconnect your hard drive by opening your computer. If the issue persists after this, then you may want to run a diagnostic tool on your hard disk drive to ensure it is working correctly. If it is, then attempt to reinstall Windows. If it is faulty, it will need to be replaced. There you have it, our Top 10 most searched Windows error codes of 2017 according to Google Trends. We hope you’ve never encountered them, but if you did, hopefully this list helped you find a solution. Errors are always a problem especially when you’re doing something important, but thankfully there are always solutions.